Preheat the oven to 350 degrees. Cook the garlic in oil for about 30 seconds over medium heat, until it starts to color a little. Add the ribs and brown on all sides. Mix together the ketchup, vinegar, broth, and spices. Place the browned ribs in a deep Dutch oven or corningware, toss the onions on top, and pour the sauce over. Cover and roast for an hour and a half, stirring once after an hour. For the veggies: Place the squash, leeks, bay leaf, and onions in a large skillet, add 1/2 cup water, and steam over medium-low heat for 20 minutes. Saute the squash in a little butter, cut side down, for a couple of minutes to caramelize it a little. 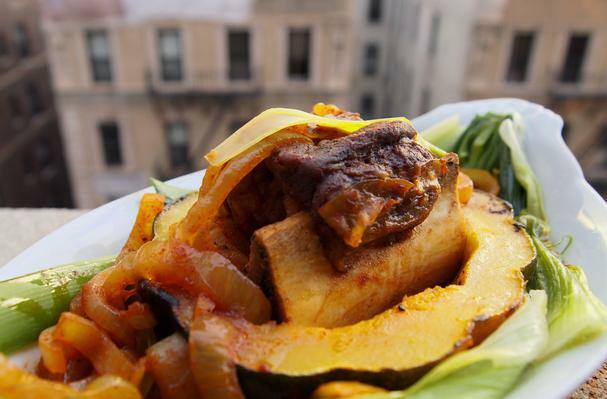 Serve the ribs in the squash, on a bed of leeks. This recipe is based on one from Louis De Gouy's classic "Gold Cook Book," originally published 1947; I reworked spices and added the veggies to give a nice freshness and wintery flavor. If you use store-bought broth (don't worry - I definitely did), make sure it's low- or no-sodium. The recipe below serves 2, but it'd be very easy to double!